Spherefication is the process of turning liquid into spheres surrounded by a thin, gel-like membrane. Essentially like caviar; bursting in the mouth with liquid with a nudge of your tongue. Filled and flavored with such ingredients as olive oil, fruit juices and vegetable purees; “crafted caviar” was once only accessible to those willing to pay a princely sum for a full on molecular gastronomy feast. But today these bubble tea places offer these things called bursting boba. They look like your average pearls but explode with fruit flavoured syrup in the mouth. 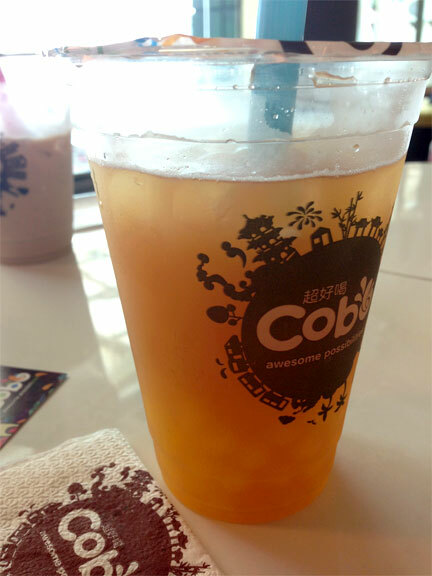 We had gone into a Cobo milk tea branch one sweltering afternoon and I got myself a mango-peach green tea base (mild sugar) with passionfruit flavored boba. Delicious way to fend off the heat. I was spacing out while bursting the pearls one by one. Or one mouthful at a time. At P80 for a cup it’s quite the good deal. And it’s just really…fun.